Derive the operations +, -, x, and / from - and reciprocal. It's like we have a calculator with broken +, x and / keys but we'd still like to use it to add, multiply and divide. How? Solving this is conceptually similar to building up a complete LISP function library from 0, successor, and comparison functions (see my functional computation article), but we can use RIES to help us discover some of the functions. where x can be anything. The first answer is what we were looking for, and we can easily plug in other numbers for π and e and see that, in general, a+b = a-((a-b)-a) which turns out to be a little different from the solution we derived ourselves above. The second ries answer involving reciprocals works too, but is needlessly complex (for example, note that π-(π-1/π) simplifies to just 1/π) and happens because ries sometimes encounters numerical round-off error and treats two results as being equivalent only if they produce exactly the same calculated result. So we have a way to do x/2, namely 1/(1/x+1/x). 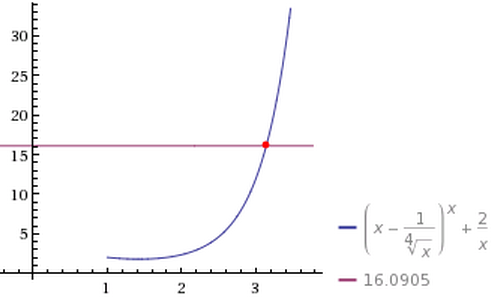 So we now have the "squaring function" f(x) = x2, which in ries is the symbol 's'. which is easily verified by algebra. We can combine this formula for 2a/b with the previously derived formula for x/2 to get an a/b formula. Once we have division, we're home free. If your brain burned out from all of the above, ries will readily show that the product ab is a/(1/b). The crudeness of the Lanczos approximation can be seen in the integer arguments: Gamma(4.0) should be exactly 3! which is 6. Similar errors are seen in Gamma(5.0) and higher. and I wanted to figure out the exact formula involving π, but just for fun, I wanted to do it without applying the induction formula Gamma(x+1) = x Gamma(x). using the Double factorial to get the products of odd numbers (Sloane's A001147). Here's another example of "enlightened discovery". The Lucas numbers, (OEIS sequence A0032, my MCS13770842) are the numbers: 2, 1, 3, 4, 7, 11, 18, 29, 47, 76, 123, 199, 322, ... with the simple recurrence relation Ln = Ln-1 + Ln-2. ries is also sometimes of use in finding errors in formulas or in calculations using a given formula. I was looking at a problem with Hypercalc's factorial function, which is based on the Stirling series. For some values of N, Hypercalc's answer for the factorial of N was wrong. For example, when N is a googol, I was getting 2.2051589684...×10995657055180967481723488710810833949177056029941963334338855462168341353507911292252707750506615682566 instead of the correct answer 1.6294043324...×10995657055180967481723488710810833949177056029941963334338855462168341353507911292252707750506615682567. The exponents differ in the last digit, and the initial digits (the "mantissa") are completely different. Hypercalc's answer was too small, by a ratio of about 16.294/2.205 = 7.389. Anyway, putting this ratio 7.389056099 into ries shows that it is e2. This gave me a clue that helped me find the problem. Since Hypercalc performs most of the factorial calculation using natural logarithms, the intermediate result was off by almost exactly 2. I soon found a problem that was causing terms that should be nearly 0.0 to be nearly 1.0 instead. In a related investigation, a value was found to be off by a ratio of about 1.58323701466. Putting this into ries revealed that it was the 4th root of 2π. There is a formula involving √2π, but apparently the square root had been taken twice by mistake. The solution x=Φ has one symbol on the right-hand-side, so Φ has a "Kolmogorov complexity" of 1. What if we're not allowed to use the builtin symbol f representing Φ? which uses 6 symbols to express Φ as (1+√5)/2. If you care more about the number of times a particular symbol is used, you can combine ries with some UNIX tools. In this example we use ries to generate the terms of the sequence A5245, which measures the "complexity" of the integers by counting how many 1's it takes to make the number using just addition and multiplication. For example, the "complexity" of 6 is 5, because you can make 6 from five 1's like so: 6=(1+1+1)×(1+1). In advance of Pi Day in 2013, I decided it would be fun to tweet a series of successive approximations to Pi. Following is the full set. To celebrate "Pi Day of fhe Century" (on 3/14/15 at 9:26:53!) I was going to make a new set of approximation examples, but I soon realised I was mostly just re-inventing examples I had done in 2013. A few were revised for 2015, as noted in each section below. This answer is equivalent to 3+√2/10, 3+√1/50, or 3+1/√50, any of which are easy to remember and may have been used in ancient times. To solve this for x, we need an equation solver. This is the opposite of ries (which is is an "inverse" solver!). One option is to use WolframAlpha and put in "<a href="http://www.wolframalpha.com/input/?i=E%5Ex-x%3D20">E^x-x=20</a>";on the resulting page click the button saying "Approximate form", then More digits; WolframAlpha will tell you one solution is around 3.1416333. ... and we're back to ex-x=20. Click the image to see the WolframAlpha page; there are several amusing "alternate forms" near the bottom. This is a "continued radical" approximation, like a continued fraction but using square roots in place of the reciprocal. I gave ries various "random target numbers" that were within π/106 of the value of π (that is to say, accurate to within one part in a million). For most of these, I asked ries not to use the trigonmetric functions or π itself in the answers, and used --max-match-distance to ensure its answers were close enough to therandom target to also serve as an approximation to π. The first is the well known 3 1/7; the second is 3+10/71; Archimedes proved that π is between these two. The third formula "1/(1/4*4+4+3)+3" is equivalent to 335/113. The answers shown are equivalent to 3+1/6, 3+1/7, 3+1/(7+1/8), and 3+1/(7+1/16) respectively. In the runup to Pi Day 2013, @numberphile put up a charming video called calculating pi with pies. I'll turn it around and calculate "PIE" with π's! which differs from the real value of π by about 1.18×10-6. The versions for 1 and 2 were both derived from the "1's and 2's" version, which was 1/(1/(2*2*2*2)+2+2+1+2)+1+2, and you can easily see this is equivalent to 1/(1/(7+9)+7)+3 from yesterday. For the digit 0, you can apply the common definition 00=1 and change every 1 in the "all 1's" expression to 00. This can be used as an iterative formula, starting with any number. For example, start with x=2 and then compute √((1/√(1+x))e3), and you get 3.405347287. Now use that as the new value of x and continue: 3.093475530, 3.150784303, 3.139852027, ... Repeating many times x converges on 3.1415926825119..., which is not π but probably good enough to fool your friends. π4+π5 is 403.4287758..., and e6 is 403.4287934...; a very near coincidence indeed! This example could be used to troll your classmates (but please don't). We ask ries for an approximation to π with no restrictions except for π itself and the trigonometric functions. It is perhaps even a bit more convincing to those who know that π and e are both transcendental. I have a calculator that has only five working keys: x2, √ , ln(x), ex and the power key. When I turn it on, it starts with the number 0. No other keys work. Can I make it display π? Happy #PiDay! Today, several more iterative formulas that are almost true… http://mrob.com/pub/ries/index... using #RIES for #maths and #number fun! In this example we'll be doing high-precision approximations for π (with errors ranging from 1.11×10-9 down to 9.97×10-15). Let's find a few more of the "iterate x=f(x)" type approximations, like yesterday's Dr. Matrix example. This requires answers from ries that involve more than one x. I'll use the -aoption to limit it to algebraic numbers, but also exclude the trigonometric functions with -NSCT. In order to get more x's I'lldecrease the "weight" (complexity) of the x symbol with --symbol-weights 8:x. I also use -s to shift everything to theright-hand-side except for one x. The -l5 option just makes itsearch longer. If x is 2, x' is about 3.103. Continuing, the next iteration x'' is about 3.1404; this converges rather quickly on 3.1415926546965... (error 1.11×10-9). This converges on 3.14159265358738..., which is only 2.40×10-12 from π.
so no iteration is needed. The value differs from π by 2.06×10-13. Later today I'll add several "closed-form" approximations for π, going up to 14 digits of accuracy. The formula (6*(√(7/2)+5))^(-phi/7)+e gives π to 14-digit accuracy. Many more at http://mrob.com/pub/ries/index... using #RIES to celebrate #PiDay ! to get many closed-form approximations. After a while I'll increase the search level to -l8 and add the options--max-match-distance 7e-13 and --no-refinement to get lots ofvery close, but more complicated answers. That's it for my PiDay examples. Check the rest of this page for earlier items you may have missed, and try your own numbers in RIES online!